Who are the real “experts” in fantasy football? Are they the people who risk thousands of dollars in entry fees to enter high stakes fantasy football leagues? Or are they the people whose articles and player rankings that we read on a daily basis across the various industry websites, and through social media? The 2018 FFPC Pros vs Joes Draft Challenge enters its 10th year of competition. As in the past, the competition pits the high stakes players (Joes) of the FFPC (Fantasy Football Players Championship) against a slew of fantasy industry experts (the Pros). Six individual 28 round Best Ball drafts are conducted to see who the best fantasy prognosticators are, as they draft BEFORE the preseason games of the NFL get cranked up. Prizes for the league winners in 2018 once again consist of FREE entries into the 2019 FFPC Main Event valued at $1,800 per entry. That’s a 1 in 12 shot at a huge prize for each participant, so this continues to be a highly coveted, limited, and exclusive contest. So how does one get an invitation to participate? The “Joes” consist of players from the Fantasy Football Players Championship. Candidates for selection are pulled from those players who register early for the 2018 FFPC Main Event. Registration by Thursday May 31st, 2018 makes you eligible for the drawing. In addition, you will receive $100 off the regular price for the first team, and $250 off the regular price for each additional team. Each team purchased counts toward one (virtual) ping pong ball in the selection lottery. The “Pros” consist of industry experts/analysts, and are included via an invite-only basis after consideration by the FantasyMojo/FFPC selection committee. Curtis Patrick / Ryan McDowell – Representing DynastyCommandCenter.com – Ryan and Curtis are the final “Pro” team to be invited. They are another shared teams in the ProsVsJoes, and this is their inaugural appearance. Graham Barfield – Representing FantasyGuru.com – This is Graham’s first Pros vs Joes appearance, and is waving the flag for Fantasyguru.com, where you will find a good bit of his work on the Best Ball format. Jason Rock Phelps – Representing SportsInjuryPredictor.com – This is Jason’s first year in the competition, but he has a proven track record in winning a slew of 2017 FFPC Best Ball leagues. JJ Zachariason – Representing NumberFire.com – JJ led the overall competition at times in 2017, but some late season snafus with Amari Cooper and Antonio Brown were ill timed. He’ll take another stab at it in 2018. Scott Barrett – Representing ProFootballFocus.com – Scott represents ProFootballFocus.com, and his quick hits on Twitter pack powerful nuggets of data. Kevin O’Brien – Representing DynastyLeagueFootball.com – Kevin contributes at DynastyLeagueFootball.com and hosts The Fantasy Football Engineering podcast. This is his first appearance in the competition. Brandon Marianne Lee – Representing HerFantasyFootball.com – Brandon can be found on SiriusXmFantasy, FantasyAlarm, and HerFantasyFootball.com . Last year she won her division and came in 2nd place overall in the competition. Jen Ryan – Representing FootballDieHards.com – This is Jen’s 2nd year in the competition. Last year she narrowly missed winning the “Los Pollos Hermanos” division. Jason Moore – Representing TheFantasyFootballers.com – Jason represents TheFantasyFootballers.com triumvirate in his second appearance in the PvJ competition. Eliot Crist – Representing TheQuantEdge – Eliot is a “rookie” in the PvJ competition, but you’ve no doubt heard him on numerous podcasts and SiriusXM radio. Jake Ciely – Representing RotoExperts.com – Jake is ranked 4th (of 412) alltime in PvJ. He won the overall title in 2015, and embraces this format where he can showcase his kicker knowledge. He LOVES kickers! Bob Lung – Representing BigGuyFantasySports.com – Bob is a Fantasy “Consistency” evangelist and is a 2017 FSWA Finalist for the “Best Fantasy Football Publication”. This is his 3rd year in the competition. Jared Smola – Representing DraftSharks.com -This is Jared’s 8th year in this Best Ball expert / high stakes player faceoff. He has 1 league title on his resume, as well as two top-6 finishes the past two years. His all time rank is 10/412. Michael Nazarek – Representing FFMasterMind.com – Mike has enjoyed great success in the PvJ competition. He finished in 3rd place overall in 2015 AND 2016, and this is his 5th year participating. Scott Pianowski – Representing YahooSports.com – Scott is making his 3rd appearance in the PvJ competition after a 1 year absence. 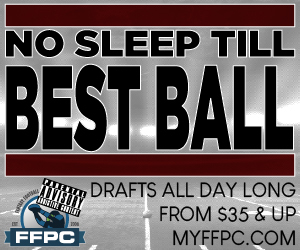 Shane Hallam – Representing FakePigskin.com – Shane specializes in Dynasty, but that in depth knowledge of rookies is essential in the deep 28 round best ball PvJ draft format . Tod Burros – Tod is a contributor to such fine sites as Rotoviz, FootballDieHards, and Fanball. Best ball drafting is his specialty (on many platforms) and he is making his first appearance in the ProsVsJoes competition. Alex Miglio / Austin Lee – Representing Footballguys.com – One of the few shared teams in the ProsVsJoes, this is their 5th appearance. In 2014 they finished 5th overall, but came in 2nd in their division. Mike Visconti – Representing FantasySportsCentral.com – This will be Mike’s 3rd year in the competion. Last year he WON the “Fat Stack” division, drafting out of the 11th spot. It was the first league that drafted, so there was no “peeking” at what happened in the other drafts. Tim McCullough – Representing InsideInjuries.com -Who would dare draft just 1 TE in a 28 round, dual flex TE premium Best Ball format? Tim did it. And won the overall title in 2014. Rich Hribar – Representing Rotoworld.com – Rich makes his 4th appearance in the competition, and is bringing his legendary position tiers. Josh Moore – Representing 4for4.com – Josh Moore is the top dog at 4for4.com and It is his 6th year in this competition. Josh Hayes – Representing Rotoballer.com – Josh is co-host on the SiriusXM Fantasy Sports “Rotoballer” radio show, and this is his first year in the competition. Sigmund Bloom – Representing Footballguys.com – Sigmund ranks 3rd (of 412) all time in the Pros vs Joes rankings. This includes 2 division titles. It will be his 9th appearance in the competition. John Paulsen – Representing 4for4.com – John last competed in the Pros vs Joes in 2015. He is elite in his ability to project fantasy production with an accuracy ranking in the top 6 at FantasyPros.com in 7 of the last 8 years. Josh Hornsby – Representing FantasyInsiders.com – Josh is an analytics based player and is currently contributing at FantasyInsiders and Rotogrinders. The best ball format is right in his wheelhouse. Mike Beers – Representing BestBallCommandCenter.com – Mike won the 2017 Pros vs Joes overall title in his first year of participation. He specializes in the best ball format. Matt Kelley – Representing PlayerProfiler.com – Matt is the high energy mastermind behind PlayerProfiler.com and the RotoUnderworld Radio podcast. This is his second year of participation in the Pros vs Joes. Evan Silva – Representing Rotoworld.com – Evan is a 4 year veteran of the Pros vs Joes and you can hear ADP shifting when he voices his opinions on players. Who ISN’T following him on Twitter? Howard Bender – Representing FantasyAlarm.com – Howard is the host of the FSTA Award Winning Fantasy Alarm show on the SiriusXM Fantasy Sports Radio channel. This is his 2nd year participating in the Pros Vs Joes competition. Dan Sainio – Representing DynastyLeagueFootball.com – Dan received an automatic bid into the 2018 competition by winning the 2017 Scott Fish Bowl. Matt Schauf – Representing DraftSharks.com – Matt is a 7 year veteran of the competition and ranks 50th out of 412 in the all time standings. Darren Armani – Representing FantasyMojo.com – Darren is the one man gang behind FantasyMojo.com and the creator of the Pros vs Joes competition. Now in it’s 10th year of competition, he is still looking for his 1st division title. Somehow, he keeps getting an invite back each year. Michael Goins – Representing DynastyFootballFactory.com – Michael is the CEO of DynastyFootballFactory.com and this is his 2nd year in the competition. A complete archive of the Pros vs Joes competition is HERE .